These justifications seem to be logically weak: the problem, however, is that they capture the imagination of large masses of people in Europe. 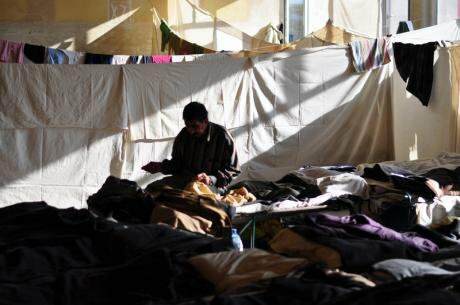 Syrian refugee in Voenna Rampa complex, Bulgaria, 2013. Demotix/Katya Yordanova.All rights reserved./Europe faces choices of which future generations will be either proud or deeply ashamed. In 1943, Bulgarians – politicians, members of the clergy, intellectuals and other citizens – effectively stopped the deportation of the 50,000-strong Jewish community from the country. This is now a reason for justified national pride or, more appropriately, for a feeling of fulfilled moral duty. At the same time, however, Bulgarians did not do anything (or not enough) to prevent the deportation of 11,000 Jews from territories in Greece and Macedonia occupied by the Bulgarian army (albeit under German overall command). The second episode – for which there is no moral justification – is a reason for shame and embarrassment. This is the moral tally of only one European nation from the 1940s, and nothing can be done now to erase it from history or national consciousness. Similarly, when the dust from the current refugee crisis settles, the most pressing question will be - who were the nations that failed to live up to basic standards of humanity; who refused to offer help to people in extreme distress caused by raging war and violence. On top of that, there will be another issue: did Europe, as a political entity, manage to find a humane and efficient answer to a difficult situation? Indeed, the scale of the crisis is now so dramatic, that left on their own some of the smaller countries – such as Greece, Hungary or Bulgaria – could hardly cope with it. Against this background, it is surprising that many such smaller nations from eastern Europe and elsewhere – such as the Visegrad Four, for instance – are positioning themselves against the European Commission’s proposed common response to the refugee situation, and especially to the ‘quota’ system of allocation of migrants. They seem to argue for a policy of ‘closure’ of borders through a system of walls, as measures stopping or redirecting the flow of refugees. In short, this position is a refusal of compassion, an attempt to shift the responsibility onto somebody else. Below I review the most popular arguments used to ‘justify’ such a position. On closer inspection they all seem to be logically weak: the problem, however, is that they capture the imagination of large masses of people in Europe. It is unclear how the intake of several million refugees from the war-torn areas of the Middle East (all amount to around ten million people at present) will noticeably alter the sociological outlook of over 500 million Europeans. This argument fails solely on the basis of simple mathematics. As Ivan Krastev has argued, the negative demographic trends in most of the European countries have contributed to a collective feeling of an impending “exit from history”, which is only exacerbated by the influx of foreigners. But the twilight and decline of Europe has been around for more than a century, and the EU is still the most economically powerful political entity in the world. In this sense, Europeans are affluent enough to afford other forms of collective psychotherapy, which will tackle their fears of extinction. Most of which are anyhow imaginary, given the vast resources at the disposal of the people living in Europe. Yes, there will be such enclaves but only if there is no mandatory “quota” system of allocation of refugees among the different states. In its absence, people will be concentrated in the countries of entry – such as Greece and Italy. The quota system will actually allow for rational accommodation of refugees, taking into account the resources and capacities of each of the member states. The question is not whether the current proposal of the EC is perfect: details may be further adjusted. But some quota system is rational and justified as policy. This is actually a rather shameful argument. If it carries the day, it would turn out that Europeans prefer a little bit more of pocket money to the respect for the basic moral duty to help people in serious trouble. Simply, Europe – in comparative terms – is very rich, and has more than sufficient resources to deal with this refugee crisis. The question is one of an effort in solidarity: that all nations do proportionately what is necessary. Chancellor Merkel, yet again, has shown leadership at the crucial moment and declared that Germany – the most powerful member state – will carry the biggest financial and logistical burden of accommodation. This much accomplished, the rest of the countries simply need to follow the good example (actually as some have already done). This is the argument through which public discourse leaves the rather mundane calculations of costs and attains an almost metaphysical level of debt and abstraction. Leaving aside most of the nonsense often churned out in discussions of ‘identity’, it needs to be said that Europe will definitely not lose its Kantian and Enlightenment identity, if it fulfils its moral duty. Neither is it going to act in a non-Christian manner, if it helps people in dire circumstances and shows compassion. Other ‘identities’ – such as a putative totalitarian one based on Nazi and communist legacies – may be negatively affected, if Europe refrains from building camps under guard and barbed-wire walls. But this is not a cause for concern: actually, rather the opposite. This is a rather hypocritical argument used mostly by non-liberals ‘concerned’ for the fate of liberalism. It implies that the European project of free movement of people, goods, capital and services is untenable and doomed to failure. Moreover, sometimes this very model of the four freedoms is blamed for the current problems with the influx of refugees. The argument goes well with apocalyptic visions of the future of a united Europe. But it is very paradoxical in nature, since part of the success of the European project – the fact that it is attractive for people from other regions of the world – is used as an omen for the impending end of Europe. It would have been more logical to prophesy the doom of liberal Europe if its own people were fleeing the region. Indeed, for management purposes some temporary restrictions on freedom of movement may be inevitable due to the refugee crisis. But this does not mean that such exceptions to the rules would undermine them beyond repair. Exceptions normally just confirm the basic rules. Walls per se have never saved Europe historically. In 1453 Constantinople – the centre of the civilized world for a thousand years, the pride of Christianity – was conquered by its enemies, when it started to resort mostly to its walls for its defence. What could actually ‘save’ Europe, if it is in need of saving, is a dynamic economy and efficient coordination among the EU member states. Other factors are good education, research and innovation, the capacity to solve collective action problems. Compared to these, walls, as a strategy, are a little bit better than hiding one’s head in the sand. This does not mean that certain walls cannot be useful, as a means of controlling and directing the flow of migrants and refugees. But walls are definitely not a substitute for a sound policy of acceptance and accommodation of refugees. The distinction between the two categories – refugees and migrants - is important: the moral and legal duty to help the former is much stronger and explicit. Therefore, the most pressing problem is to deal with the refugees coming from areas of violent conflict. Economic migration is a different type of challenge –albeit a very important one. But it could be dealt with by a different set of policies, which are more restrictive and more discriminative vis-à-vis respective applicants. Some have argued that Syrians cease being refugees the moment they leave Turkey or Jordan for Europe: they become economic migrants, since their lives have already been saved by the first country of entry. Leaving aside the legal side of the issue, such a manipulation of labels has little moral or political merit. The truth is that countries in the Middle East cannot handle the refugee influx, even if they are helped financially by Europe and others. People cannot be kept in tent camps indefinitely, neither can the economies of Middle East countries absorb the newcomers meaningfully. In this sense, shifting the burden to Turkey or Jordan does not absolve Europe of its moral responsibility. True, Gulf states could themselves do much more to help the refugees. But their failure to live up to basic moral standards cannot be an excuse for Europe to do the same. The security challenge caused by large masses of people coming from the Middle East is definitely enormous. The security services of the EU member states must act very professionally and efficiently. Probably, incidents and security failures are inevitable. To reduce this probability even certain temporary restrictions of liberties, closer scrutiny of newcomers and other measures could be discussed. But none of this is a reason for rejecting all refugees on security grounds. This is a popular argument, especially among people whose states have nothing of substance to send to the Middle East in military terms. Generally, this is an appeal for action to the US and some of the EU member states – like the UK and France, which have military capabilities. In general, an armed response to the so-called Islamic State is necessary by whatever means. This response is not, however, a substitute for a common European policy for the acceptance of refugees. Indeed, if the US and Europe share the burden of the efforts – the US taking the military part, while the EU deal more with the refugee part of the problem – the overall result is bound to be more successful. What is important is to realize that a swift military solution to the refugee situation does not exist. After all, the US had a significant military presence in Iraq, and invested heavily in the creation of Iraqi armed forces, which disintegrated the moment American troops left. This example shows that a long term plan of intervention must be designed in which the local people take real ownership. Ready-made recipes in this direction do not seem to exist, however, and success is by no means guaranteed. Therefore, in the meantime the refugee situation must be alleviated in a humane manner, and Europe cannot neglect its moral and political responsibility for that. The question of moral responsibility for the refugee crisis has become a rallying point for pro-Russian and anti-American feelings, especially in eastern Europe. American foreign policy in the Middle East is commonly blamed for all evils: it allegedly opened a Pandora box with the intervention in Iraq after 2001. This argument starts from a salient point: the deposition of Saddam’s regime by the US (and the “coalition of the willing” in which many European states took part) was ultimately an unsuccessful operation, because it failed to create stable and sustainable government in post-war Iraq. But the other premise of the argument - that had the regimes of Saddam, Gaddafi and Assad stayed in power intact, the Middle East would have been a better, safer and more peaceful place – is highly questionable. After all, dictatorial regimes proved vulnerable to ‘Arab springs’ for which the US and its allies cannot be seriously blamed. All in all, this argument exaggerates the power of the US to influence developments in the Middle East, forgets about the European input in the alleged foreign policy failures, and neglects the power of other countries – such as Russia, Turkey, or Saudi Arabia – to frame politics in the region. No matter what one thinks of US responsibilities and capacities, it is clear that Europe’s duty to help the refugees cannot be waived because of alleged failures of US foreign policy. When people are coming to Europe, they cannot be redirected across the Atlantic. What is more, Europe should not forget that in the eyes of much of the world there is hardly any difference between it and the US. And indeed, Europe has for more than half of century relied on the US for its own defence; it has benefited enormously from political stability and soundness of external boundaries due to the Americans. In such a situation, it is normal to share with them the responsibility for foreign policy failures. Slavoj Zizek has argued plausibly that a policy of open doors for refugees will lead to a populist revolt in Europe, or at least in some of the European states. But if Europe closes itself up it would be taken over by the populist even without a revolt: after all, their agenda would have become mainstream politics. It is true that a common European refugee policy needs a strong defence by non-populist parties, accepting the basic tenets of liberal democracy. Probably in some countries these parties are going to lose ground to populists due to such policies. But it is really a paradoxical strategy to try to avert such a loss by accepting the main arguments advanced by politicians such as Viktor Orban or Robert Fico. Mainstreaming populism in order to defeat it does not sound really promising. Moreover, if there are no sound other arguments in favour of the closure of European borders, why should the EU do it just to prevent certain developments in inter-party competition? The rise of populism is a process which has been with us for more than a decade now. To argue that this process will be stopped or reversed by a specific policy regarding several million refugees from the Middle East is not really persuasive. These are the most popular general arguments of those who argue that Europe should refuse its help to refugees from the Middle East. There are interesting local variations of these themes. In the poorer countries of eastern Europe, it is also common to hear that the local population is in a similar position as the refugees and deserves the same amount of solidarity and help. This is simply not true, however. Furthermore, some argue that countries like Bulgaria and Romania have not managed to integrate their own Roma people, which means that they cannot integrate refugees either. This is also a confused argument, since many Roma people have been actually integrated. For those remaining, the refugee crisis could actually be an opportunity: successful policies carried out with the help of the EU regarding refugees could be equally applied to some of the Roma people as well. Finally, some have paradoxically argued that Germany and other rich countries are going to take the ‘cream’ of the refugees – the most educated and qualified – leaving the others for the poor states. This curious argument tries to portray even acts of solidarity and compassion as essentially egoistic. The problem, however, does not lie in the actions of the German government, which does not discriminate among refugees, but in the capacities of eastern European economies to attract and retain talent: the moment they become more competitive, their comparative disadvantage will disappear. But all this has little to do with the current refugee situation. All in all, similarly to the Eurozone crisis, the EU is in a situation in which it has ample and by any stretch of the imagination sufficient resources to tackle a significant challenge - the influx of refugees. What is currently missing for a successful response is coordination, streamlined political action, and leadership. The hope is that the EU and politicians, such as Merkel, are going to prevail over centrifugal and populist forces. Populism is becoming EU’s central problem, and it does present a serious hurdle to decisions from which all countries are going to benefit in the medium term. Whether the EU, despite raging nationalistic populism, will manage to establish itself as a successful political project is a very important question indeed. But it is an even more pressing question whether the union, and its member states, will fulfil their basic moral duty – to help people who desperately need such help. This duty should have absolute priority compared to other prudential, financial, identity or partisan arguments.